1.All of your AngularJS application files will live in the app/js directory. 4.The controllers/ directory contains all your application controllers, separated into their own files. You will continue this separate file convention as the application grows. 5.The services/ directory contains all your application services, following the same file convention as controllers. 6.The directives/ and filters/ directories are empty, but they will contain all your custom Angular directives and filters. 2.The user may also choose to navigate to a favourites page that will display some thumbnail images of their HTML 5 local storage persisted favourites. These thumbnails may be clicked on to show a pretty standard ColorBox (Lightbox etc etc type thing) jQuery plugin. The declarative process is easier to understand. You can package code as reusable modules. The modules can be loaded in any order (or even in parallel) because modules delay execution. Unit tests only have to load relevant modules, which keeps them fast. End-to-end tests can use modules to override configuration. 1.Mobile apps – You can create Mobile Web Apps with AngularJS and Phonegap; there’s a project that binds the awesome mobile framework LungoJS with AngularJS. It’s called Lungo-Angular-Bridge or just LAB. 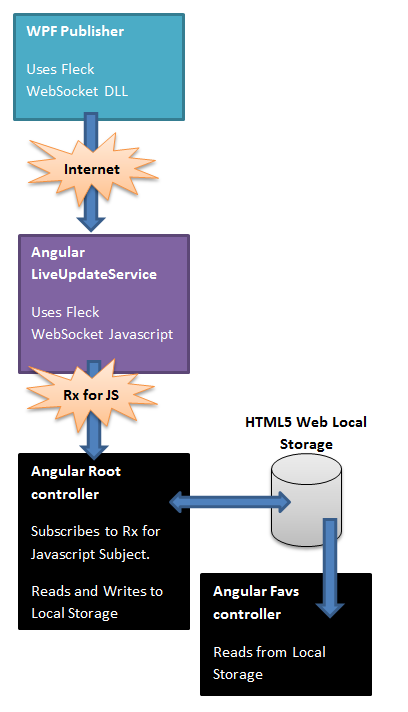 2.CRUD Web Apps – Probably this is the most common use of Angular JS. It includes nice examples for creating a simple CRUD application with Directives, Resources and Services. 3.Chrome Extensions – The easiest way to create a Chrome Extension (either packaged or not) is through Yeoman, its Chrome Extension Generator. 4.Testable JS Apps – AngularJS is fully powered with Test Suites. The chat application is really the sweet-spot example for Node.js: it’s a lightweight, high traffic, data-intensive (but low processing/computation) application that runs across distributed devices. Node.js is easily employed as a server-side proxy where it can handle a large amount of simultaneous connections in a non-blocking manner. It’s especially useful for proxying different services with different response times, or collecting data from multiple source points. It is possible to process files while they’re still being uploaded, as the data comes in through a stream and we can process it in an online fashion. This could be done for real-time audio or video encoding, and proxying between different data sources. It can be used as Web socket server : A typical example of this is a chat server. Fast file upload client: when there are big file to be uploaded, to make sure that they don’t block so that you can upload more than one file at a time. Node.js is a lightweight platform. Node allows the reuse of the same model and service interface between client-side and server-side. Npm shrink wrap and package.json were introduced a while back to set up standards, but the issue of standards is still a work in process and some issues still exist. The whole callback, event-driven, functional programming aspects of Node.js can add a learning curve burden to server-side programmers of other object-oriented languages. Asynchronous and event-driven code inherently adds more complexity to the code versus a synchronous code. 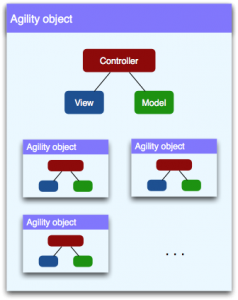 Agility’s architecture follows one of the simplest MVC patterns: users define Controller functions, which make direct calls to, and handle events from Models and Views. The diagram below illustrates this. Agility objects are lightweight in memory (through pervasive use of prototypes), this comes at little performance cost. Every Agility object can serve as a container of other Agility objects. 1. cheaphotels.co.uk – Cheap Hotels is an online search engine and deal finder for hotels across the globe. 2. OpDots.com – OpDots is the “see everything” dashboard for your enterprise data. 3. The Wall – The Wall is a minimal Twitter clone, where everyone can post anonymously to a virtual “wall”. It illustrates most features offered by Agility, including server-side persistence. Backbone came out in June 2010, and its community is nearly as large as Angular’s. It helps to organize your code and makes it easier for you to develop single-page web applications. Many popular applications use the Backbone framework, including Twitter, Foursquare, and LinkedIn Mobile. A number of music apps were built with Backbone, including Soundcloud, Pitchfork, and Pandora. Backbone is extremely lightweight, which means it’s good for building fast and responsive applications. Backbone.js has hard dependency on underscore.js and a soft dependency on jQuery. 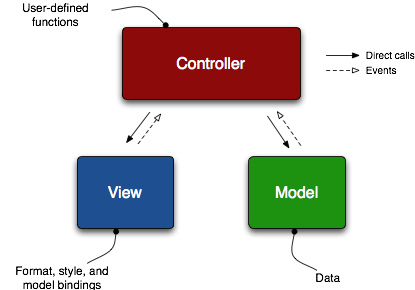 Backbone views are used to reflect what your applications’ data models look like. They are also used to listen to events and react accordingly. It contains the interactive data as well as a large part of the logic surrounding it: conversions, validations, computed properties, and access control. Routers are used for routing your applications URL’s when using hash tags(#). Defined routers should always contain at least one route and a function to map the particular route to. Backbone collections are simply an ordered set of models.